Maureen, a Dexter, is a bred heifer who will calve in June. We’ve finally made the jump to having a (relatively) large farm animal. 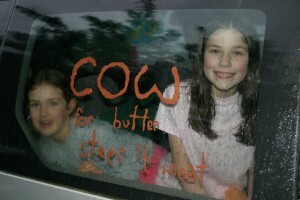 On April 26th, Maureen the cow, and Pete, a companion steer, arrived at our place. Kathy has been cow-shopping for more than a year, and it didn’t take long to conclude that Dexters were the right breed for our place. Even a “small” Jersey cow is a lot of animal, and there were several farmers who commented on how healthy and intelligent their Dexters were when compared to others they have had. Newman Turner’s books specifically mention Dexters as a good breed for farms with poor soil. Dexters are not miniatures, but they are still quite small–less than 600 lbs. The top of Maureen’s head is a couple inches below my shoulder, but she still is a whole lot bigger than our goats! Girls with silly-putty say: "Cow for Butter, Steer for Meat"
The more difficult criteria was finding one which had been handled enough to be comfortable & gentle around people AND was in good condition. It seems that either they have good, grass-fed constitution but are wild because they never get handled, or they are well handled & gentle but have the sway-backed, weak ankled signs of a poor grain-fed animal. 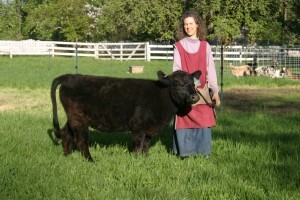 Maureen came from a farm in Lake Stevens, WA from a woman who needed to reduce her herd size. 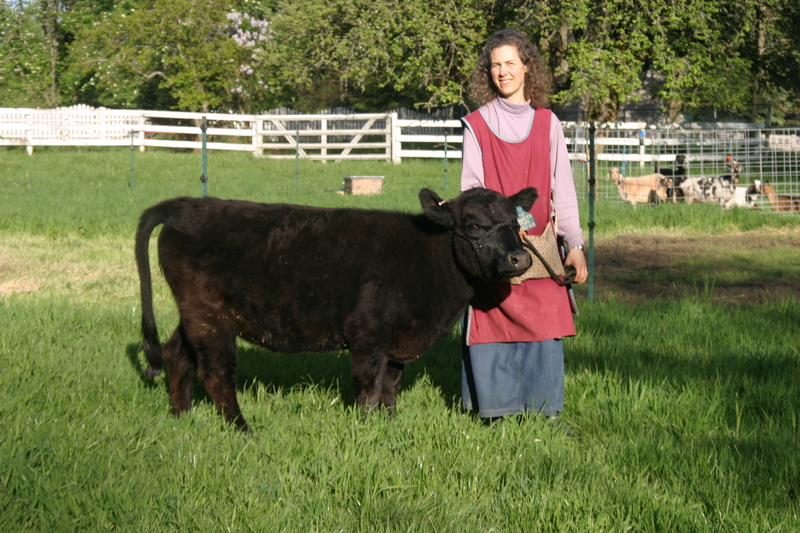 However, Maureen wasn’t for sale until Kathy explained her goals of finding a gentle, grass-fed milk cow for a family with 4 young kids (who happened to be along that day), and specifically asked if a bred heifer was available. The owner had another cow in mind for us, but decided that we’d love Maureen enough to let her come our way. God certainly helped things fall together for us! This entry was posted in Cows, Farming and tagged Dexter, grass-fed, milk cow. Bookmark the permalink.